Tell us about your writing space. 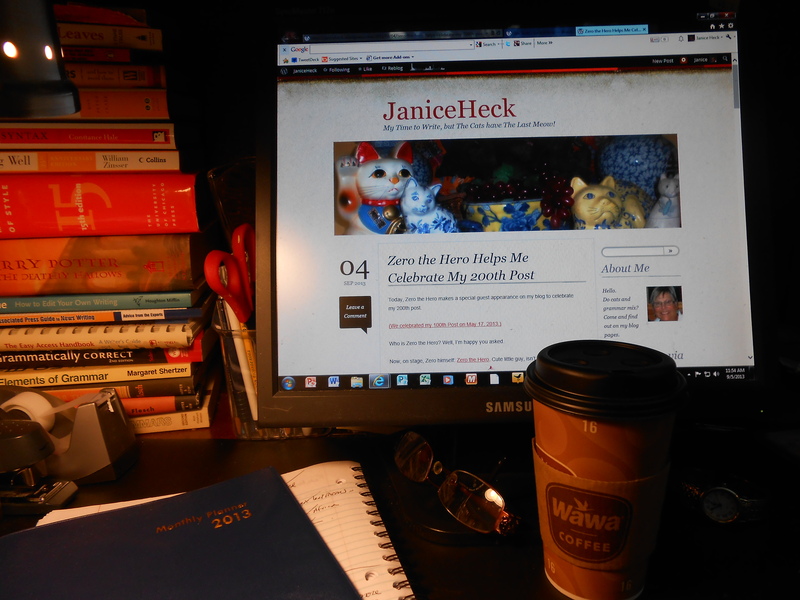 Where do you write your blog posts? Notice, however, that this was a bit of a close-up shot. That was for a reason. The wider the view of my desk, umm, let’s just say that the more chaos clutter things appear on the desk. Important things. Post-it notes. Reference books. Current reading books. Notebooks. Printed pages of blog posts from NaBloPoMo, November Photo A Day prompts, BlogHer posts, Research page prints, and so on ad nauseatum. Here’s a little more honest wider view of my writing space. Still, this is a somewhat organized chaos desktop with all I need within handy reach. What? You want me to step back further for an even more honest wider view? Well, gee. I think my camera just ran out of film. Digital camera? Well, who said that? Let’s just leave this alone, okay? 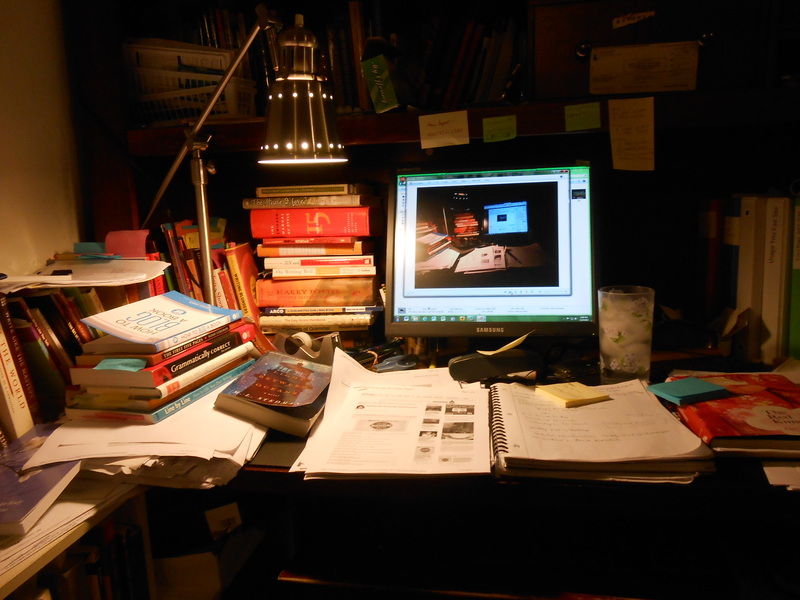 You wanted to see my desk, and here it is in all of its cluttered glory. Now it’s time to get back to some serious blogging. 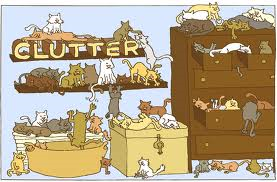 Besides, the cats are meowing to get their turn. Blimey! Another Blog Challenge? NaBloPoMo. OK, I’m In. Okay. 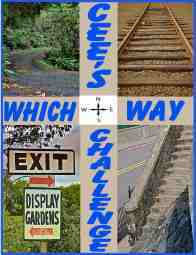 I am a pushover for blog challenges. For two years running, I have completed the A to Z Blog Challenge in April and will probably jump on the bandwagon again next April. I learned a lot from those challenges, mostly that I like challenges, that they get me to write more, and that I can complete them. 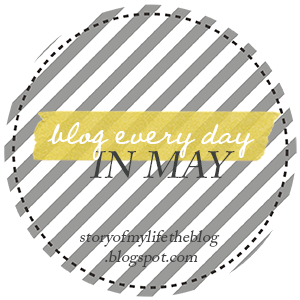 This year I joined the Blog Every Day in May Challenge. Hmm. Maybe two challenges so close together is a bit much. I have climbed aboard on Cee’s Fun Foto express which provides challenges of various types, but mostly related to photography. 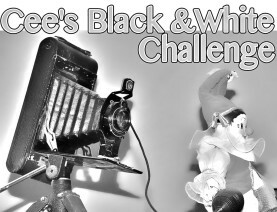 I wrote about some of those challenges in a blog post here: Newly Discovered; Cee’s Photo Challenges. I enjoy the photography challenges and take tons of pictures, but they sit on my computer. After all, who wants to see 200 photos taken in one day! Now I have an outlet for these gems. The photography challenges encourage you to think in different ways and to look at things from all angles. You get some surprising results when you do this, and you get new ideas for writing. One last challenge: WANAFriday. 100 bloggers with a range of experience in blogging joined with Kristen Lamb for a blogging experience: WANA112. Kristen’s primary message for all of us was this: We Are Not Alone (WANA). As bloggers, we need to stick together and encourage each other, to give feedback, and to share thoughts and feelings. My WANA112 group is probably most responsible for keeping me going as a blogger. Now with almost two years at blogging and 225 posts published, I feel much more confident about posting and joining challenges. This WANA112 group of 100 friends has largely stayed together now for over a year. Ninety of us joined a closed Facebook group where we post about whatever is on our minds. About six months ago, several members of the group suggested we start our own challenge, and so began our own WANAFriday challenge. One member of the group posts a prompt for the rest of the group, and those who have the time and inclination respond to it. Between five and ten people respond each week. Every year about this time, NaNoWriMo (National Novel Writing Month) comes around. The goal is to write 50,000 words on a novel in one month. I am not really a fiction writer, so the idea of writing 1,600 words a day does not grab me at all. As an alternative, NIna Amir organized WNFIN (Write Nonfiction in November) or NaNonFiWriMo (National Nonfiction Writing Month) for nonfiction writers. While I do write more nonfiction than fiction, I cannot imagine writing 50,000 in one month. One year, maybe. You don’t have to write 50,000 words during the Write Nonfiction in Nov. Challenge…you can write an essay, an article, a report….or a book of any length. And we can’t leave the poets out. NaPoWriMo challenges all poets and non poets to write 30 poems in one month. I haven’t tried this challenge yet, but I have it tucked in the back of my brain for future reference. If you want to sign up for NaBloPoMo, click here: NaBloPoMo, November 2013, Blogroll. Look for the November writing prompts here. It’s Monday: What Are You Reading? Five Sentence Fiction: A new prompt word given each week. We really don’t care how many challenges MaMa Jan gets into, just as long as she doesn’t forget to give us kibbles and cuddles and lets us nap whenever and wherever we want! She knows our motto: “Eat, Play, Nap.” What else is there for cats to do in life? P.S. Please add links to other blog challenges in the comment section. Thanks. PSS. See you tomorrow on NaBloPoMo. 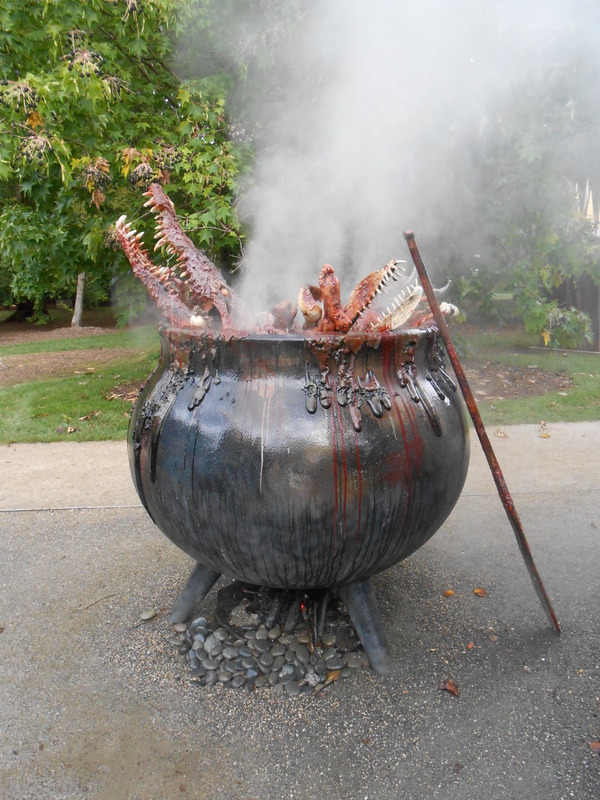 Witches ~ What images does this conjure up? Deep in the woods of NJ, I found this triad of witches, no doubt conjuring up their next evil deeds, their cauldron brewing in the background. I could hear them snickering and cackling and chortling over their dubious devious designs. I could only pick out a word or two here and there of their conversations (“tasty morsels,” “scaredy-cat kid porridge,” “brat soup,” “leg of kid,” “liver pâté,” and “jellied hearts”). The witches had big plans. I snuck up for a closer look. Okay, here’s the truth: Before I left for a vacation in California recently, a friend and I visited Grounds for Sculpture, an exquisite 35-acre park located at 18 Fairgrounds Road in Trenton, New Jersey. 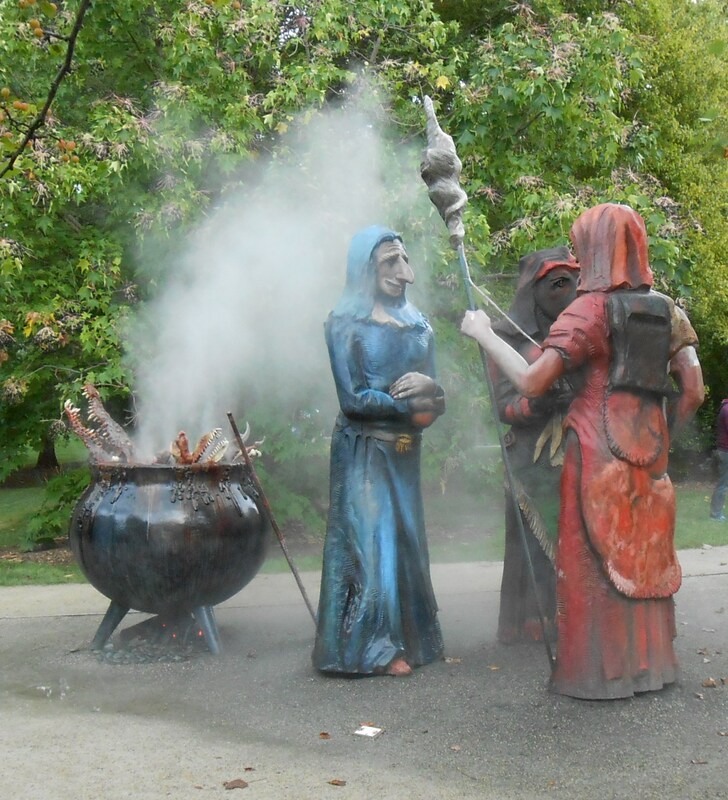 We found these witchy, bigger-than-life statues among the garden sculptures. What an astounding place. 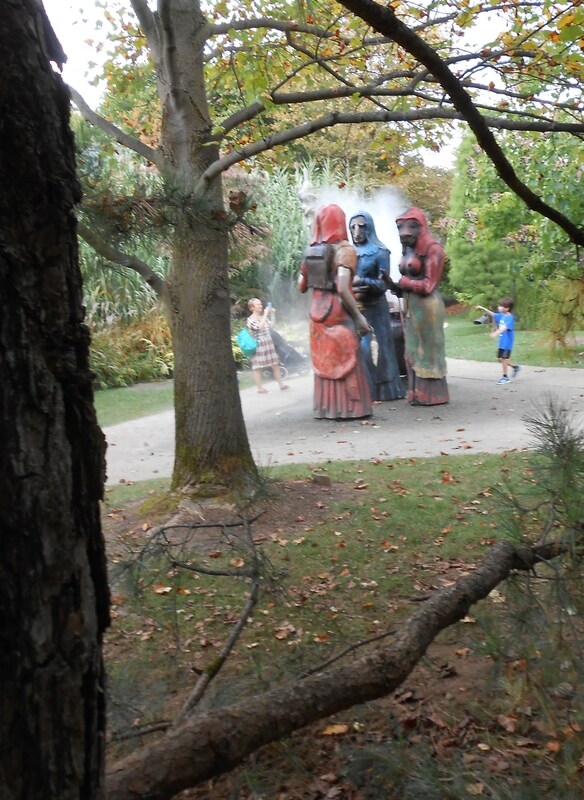 We were surprised and awed at the variety of sculpture, the beauty of the gardens, the whimsical nature of some of the sculptures, and the humor in the displays. This is a very special place for a day trip. We had our own delicious lunch at the Rats Café on the Grounds for Sculpture property. (Rats Café from The Wind and The Willows.) Definitely go visit this place! Here are some witchy views from other WANAites. I love words like serendipity, scintillating, effervescent, splendiferous, grandiloquent, sibilant, and supercilious. All these multisyllable words sound pleasing to me. Some of them have somewhat haughty meanings, but they still sound interesting, sweet, and maybe a bit humorous. My husband likes the word magnanimous and money. Yes, money does have a nice ring to it, doesn’t it. Siri Paulson already wrote about serendipity, so I had to choose another word for this prompt challenge. A recent Facebook posting reminded me of another word I like: Dandelion. Yes, folks, dan-de-li-on. Some folks consider it a weed, but where I come from, we know better. Not that dandelion has always been a lovely word for me. 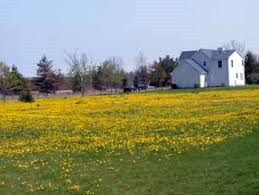 When I was a kid, those egg-yolk-yellow dandelions blanketed our football-sized front and side lawns, squeezing out the more desired green-velvet grass. Mom, always looking out for what the neighbors thought, decided that a dandelion infested lawn in our nice neighborhood was not socially acceptable, so she decreed that we kids had to get out there on perfectly good icy-cold-Maurice-River-swimming days to dig out these perverse lawn inhabitants and dispose of them. Mom didn’t like it when the flowers turned from yellow to white puffy balls, and the feathered seeds starting flying through the air on the light summer breezes, seeking new rooting grounds (notably our neighbors’ lawns) to infest. (What would the neighbors say then?) And, beware, if any one of us kids ever, ever, ever blew on those fluffy seed balls, trouble would surely follow. Back then, there were no taboos about spanking children! No. Mom wanted those dandelions out of her lawn. Pronto! We thought this whole dandelion destruction debacle was a losing battle, but Mom had different ideas. She was determined to have a lawn as nice as Mrs. Cervini’s down the street. Well, Mom won. After that summer, our lawn did look as nice as Mrs. Cervini’s. Green, nicely trimmed, and dandelion free. We kids felt pretty proud about that, too. What? Dandelions Can Be Eaten? Who Knew? We didn’t know that dandelions were valuable when we were digging up and disposing those dastardly weeds to make Mom happy. 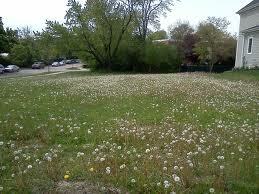 Yes, dandelion is a valuable food crop in early spring. 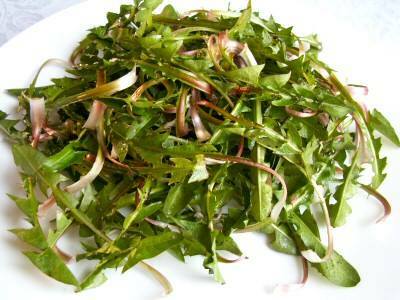 You can use dandelions in soups, salads, fritters, muffins, breads, and even tasty wine. I haven’t heard of a dandelion dessert, but who knows, some creative chef out there may have dreamed up a sweet, melt-in-your-mouth dandelion dish. 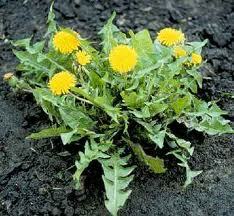 Vinelanders hold dandelions in high esteem in a special spring festival each year. A dandelion dinner at Merighi’s Inn on East Landis Avenue is the real deal. Di Bell digs deep and finds some wonderful lost words. 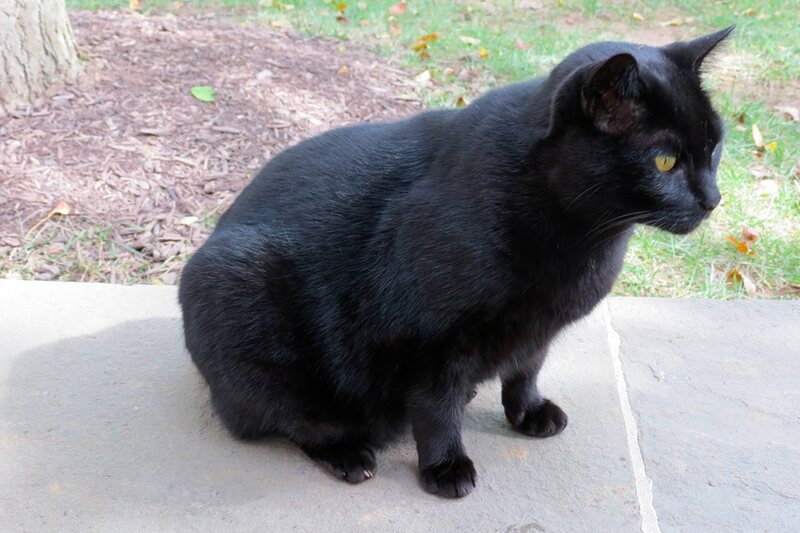 Ellen Gregory shares her love of kitties with the word ailurophile. Kim Griffin goes nostalgic with a Mary Poppins’ word. Siri Paulson beats me to the punch with serendipity. Favorite Word? For a cat? That’s easy. Eat-play-sleep. That reminds me. I think it’s nap time now. 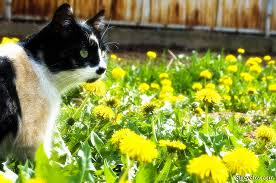 Maybe I’ll head out to the dandelion patch and take a snooze.